I searched around etsy and found these beauties. Enjoy! Anna Maria Horner's Pressed Flowers in Rose fabric. So pretty & dainty! Reversible Tote Bag from the bag shop. Pillow Cover in Raspberry Plumes from Nestables. (They have the cutest banner in their shop!) This is also the fabric I bought for my skirt. Knitted Headwrap/Ear Warmer from Flapper Fashions. So cute!! I had a friend make me a brown one similar to this and i love it. It keeps your ears warm without giving you hat hair! Adorable Apron from Shop Lissy. Super cute shop with lots of baby stuff! I love her little party hats. too cute. Coffee Cuff from Oh, Sweet Joy. haha How did that get in there? Shameless Plug. 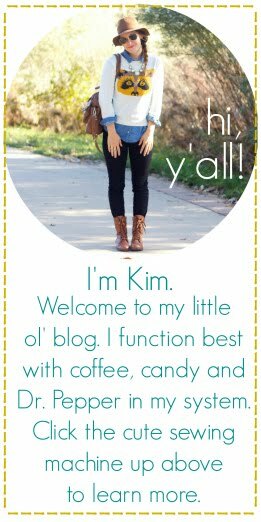 It's my blog and it just so happened to fit :) Not to mention, there are some matching earrings as well! Happy Monday. It's taco night in the Davis household! Ole! Nice picks! I love Anna Maria Horner's fabrics. Can't wait to see your skirt! Thanks so much for featuring my apron! Anna Maria Horner's fabrics are some of my faves too... fabulous colors! 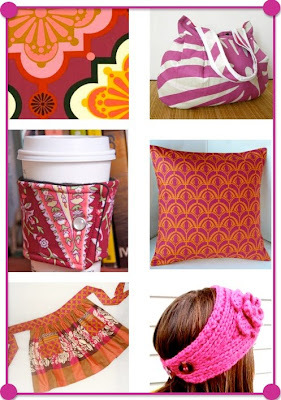 Thanks so much for including my Fuchsia Flapper Headwrap!! What a fun selection of pink items! Love them all, especially the pink headwrap from FlapperFashions!